Hilton Green, an eighth-grade student at Dutcher Middle School in Turlock, works on his lateral movement during a recent training session at Bonsu Elite Athletics. Green does gymnastics and plays football. Bonsu Elite Athletics will celebrate its 10th anniversary in April and in those 10 years it has helped countless local athletes reach their full potential. 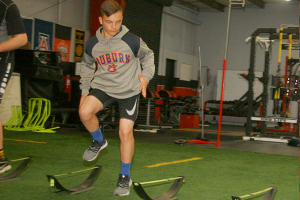 Bonsu Elite Athletics specializes in speed, agility and strength training. The majority of Bonsu’s clients are in high school, though he offers sessions for college, middle school and youth athletes. On a typical day Bonsu will see about 60 clients. Bonsu has been the go-to trainer for many of the top athletes in the area, including Kendall Wesenberg, Johnny Mundt, Ja’Quan Gardner, Cade Cowell, Nicole Bates and Madilyn Nickles. Wesenberg, 28, finished 17th overall while representing Team USA in the women’s skeleton competition at the 2018 Winter Olympics in South Korea. “I first started training with him (Bonsu) in 2013 at his facility on Bangs in Modesto,” said Wesenberg, a 2008 Central Catholic High School grad who completed her college education at the University of Colorado. “I wasn’t great at Olympic lifting and he coached me. He also helped me with my sprint forms and mechanics. That helped me move more efficiently. Mundt, a 2013 Central Catholic graduate who played tight end for the University Oregon, suited up for the Los Angeles Rams in Super Bowl LIII last month. He made one tackle on special teams. Ja’Quan Gardner (left) started training with Les Bonsu (right) during his sophomore year at Central Valley High School. Gardner, pictured giving Bonsu his San Francisco 49ers’ jersey, currently plays running back for the San Diego Fleet in the Alliance of American Football league. 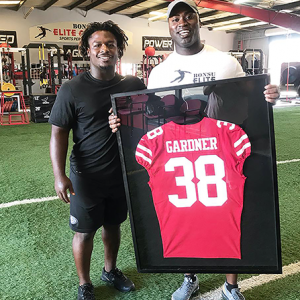 Gardner trained six times a week at BEA leading up to the 2018 NFL Draft. The 2014 Central Valley High School grad and former Humboldt State star running back signed a contract as a rookie free agent with the San Francisco 49ers in August. He currently starts for the San Diego Fleet in the Alliance of American Football league. Cowell, 15, signed a five-year contract with the San Jose Earthquakes of Major League Soccer in January. He recently logged playing time in two preseason matches. Bates (Ceres High) and Nickles (Merced) are standout softball players at Washington and UCLA, respectively. They played for the USA Softball Women’s National Team during the summertime. BEA has had more than 150 athletes earn scholarships to college. 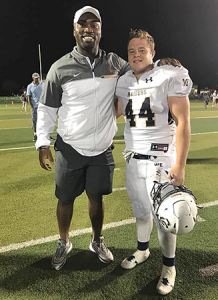 Central Catholic grad Coleby Garrett earned a football scholarship to Cal Lutheran thanks to the training he received at Bonsu Elite Athletics. Garrett was one of Les Bonsu’s first clients. Coleby Garrett, 19, started training with Bonsu when he was in the fifth grade at Whitmore Charter School in Ceres. The 2018 Central Catholic High School grad played fullback and special teams for the Cal Lutheran football team as a true freshman this past fall. In January, Bonsu attended a workshop at Notre Dame that focused on the latest stretching and recovery techniques. BEA’s current home is a 9,000-square-foot sports performance training facility is located at 3427 Railroad Avenue in Ceres. BEA operated out of a 900-square-foot studio at 3025 McHenry Avenue in Modesto during its first two years of existence and then a 2,500-square-foot center at 401 Bangs Avenue in Modesto. The facility is open from 2 p.m. to 9 p.m. Monday through Friday and from 8 a.m. to 2 p.m. on Saturday. For more info about BEA, call 247-2695.